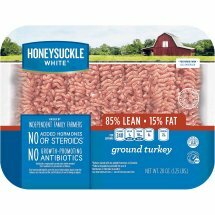 Honeysuckle White 85% Ground Turkey 1.25 lb. With only 1 gram of saturated fat and 26 grams of protein, 97% Lean Ground Turkey is an incredibly wholesome, protein-packed option for the health-conscious consumer. Flavorful and low in saturated fat! Unapologetic meat lovers can eat well and feel good too. Refreshed look, same great taste! Our package design is as high-quality as what's inside. Look for Honeysuckle White clean, eye-catching packaging in stores today. ALL NATURAL** TURKEY, NATURAL FLAVORING.